Wireless microsensors have enabled new ways to monitor our environment by allowing users to measure spaces previously off limits to research, such as toxic areas, vehicle components, or remote areas in the human body. Researchers, however, have been stymied by limited improvements in the quality of data and sensitivity of these devices stemming from challenges associated with the environments they operate in and the need for sensors with extremely small footprints. A new paper published today in Nature Electronics by researchers at the Advanced Science Research Center (ASRC) at The Graduate Center of The City University of New York, Wayne State University, and Michigan Technological University, explains how new devices with capabilities far beyond those of conventional sensors can be built by borrowing concepts from quantum mechanics. The team, led by Andrea Alù, director of the ASRC's Photonics Initiative and Einstein Professor of Physics at The Graduate Center, and Pai-Yen Chen, professor at Wayne State University, developed a new technique for designing microsensors that allows for significantly enhanced sensitivity and a very small footprint. Their method involves using isospectral parity-time-reciprocal scaling, or PTX symmetry, to design the electronic circuits. A 'reader' is paired with a passive microsensor that meets this PTX symmetry. The pair achieves highly sensitive radio-frequency readings. "In the push to miniaturize the sensors to improve their resolution and enable large-scale networks of sensing devices, improving the sensitivity of microsensors is crucial," Alù said. "Our approach addresses this need by introducing a generalized symmetry condition that enables high-quality readings in a miniaturized footprint." 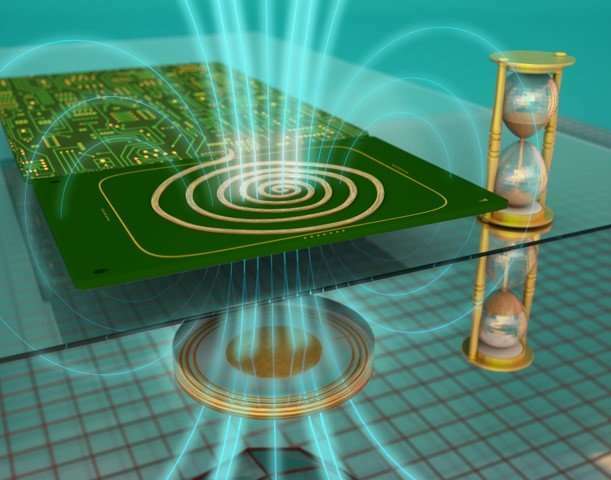 The work builds on recent advances in the area of quantum mechanics and optics, which have shown that systems symmetric under space and time inversion, or parity-time (PT) symmetric, may offer advantages for sensor design. The paper generalizes this property to a wider class of devices that satisfy a more general form of symmetry—PTX-symmetry. This type of symmetry, is particularly well-suited to maintain high sensitivity, while drastically reducing the footprint. The researchers were able to show this phenomenon in a telemetric sensor system based on a radio-frequency electronic circuit, which exhibited drastically improved resolution and sensitivity compared to conventional sensors. The microelectromechanical (MEMS)-based wireless pressure sensors share the sensitivity advantages of previous PT-symmetric devices, but crucially the generalized symmetry condition allows both for device miniaturization and enables an efficient realization at low frequencies within a compact electronic circuit. This new approach may allow researchers to overcome the current challenges in deploying ubiquitous networks of long-lasting, unobtrusive microsensors to monitor large areas. In the age of the internet of things and big data, such networks are useful for wireless health, smart cities, and cyber-physical systems that dynamically gather and store large amounts of information for eventual analysis. "Development of wireless microsensors with high sensitivity is one of the major challenging issues for practical uses in bioimplants, wearable electronics, internet-of-things, and cyber-physical systems," Chen said. "While there has been continuous progress in miniature micro-machined sensors, the basics of telemetric readout technique remains essentially unchanged since its invention. This new telemetry approach will make possible the long-sought goal of successfully detecting tiny physical or chemical actuation from contactless microsensors."